Home » Providers » Samuel E. Sunshine, M.D. Dr. Sunshine is a Bay Area native and attended college at Stanford University. He is a graduate of the Keck School of Medicine at the University of Southern California and completed his residency in Family Medicine and fellowship in Sport Medicine at Kaiser Permanente Fontana Medical Center. Since graduating in 1999, Dr. Sunshine has been practicing both Family Medicine and Sports Medicine and is board certified in both specialties. Like many other physicians, Dr. Sunshine went into medicine to help others. His father is a physician and still loves going into work everyday. His father inspired him to pursue a similar career path and work ethic. 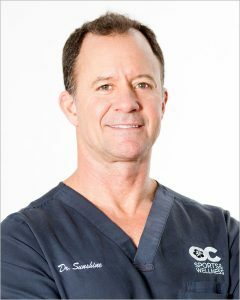 During the past 15 years, Dr. Sunshine has established a fulfilling career cultivating personal relationships with patients and their families. Dr. Sunshine strives to be a resource and an inspiration to his patients. He lives a lifestyle that he preaches daily to his patients. Hippocrates was quoted as saying, “Let food be thy medicine and medicine thy food.” Dr. Sunshine believes we can improve our health simply by living a healthier lifestyle through proper nutrition and regular exercise. Our health is our number one asset. He emphasizes this point to his patients and helps them understand that prevention of illness is more important, cost-effective and rewarding than treating disease. He believes that the four pillars of good health are proper sleep, stress reduction, daily exercise and proper nutrition. Dr. Sunshine cares for a wide variety of athletes and weekend warriors in his practice. He has served for years as the team physician at Concordia University where he has also taught General Medicine courses to athletic training students. He has focused his work on regenerative medicine using ultrasound guidance to perform platelet rich plasma and prolotherapy injections with very high success rates in healing troubling sports injuries. He is also been a volunteer faculty member at the Keck School of Medicine at the University of Southern California since 2005 where he has the opportunity to mentor 3rd and 4th year medical students interested in family and sports medicine.